This is one of those Why didn't I think of that? moment!! As we head towards warm weather again, you will probably put your winter boots away soon - hopefully! But if they droop, it is bad for the fabric/leather material. You could stuff your boots with newspaper, but that usually doesn't work so well. 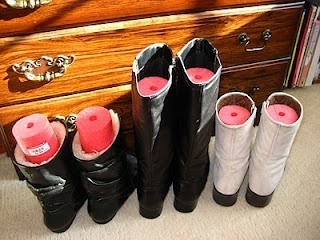 You could buy Boot Stands, but they can be expensive - especially if you have more than one pair of boots! Why not use a pool noodle in place of boot stands? It is so much cheaper ($1.00-$2.00 at the Dollar Store). Just cut them to fit your boots - tall or short! Christina Michelle York-Rehn posted: Great idea! Danielle Fouts posted: Smart! I hate when my boots get misshapen! Mary Lynn Riffe posted: Good idea! Lisa Ferguson Sullivan posted: I'm going to buy some tomorrow! Thanks for sharing!!! Ana Perales posted: Seriously?! Total duh moment! Angela Bergman posted: I use wine bottles, but this idea is so much better! Lori Doddington Singer posted: The best way to cut them is with an electric knife! Cynthia Carter-Lee posted: sharing !!! Stacey O'Neill Hy posted: I actually do something similar, but I use the cardboard tubes from paper towels and wrapping paper.